Chocolate. Even the word itself fills me with the warm fuzzies of my childhood. I think that is the reason Halloween is my favorite holiday. The thought of dressing up in an elaborate costume for the sake of getting gobs and gobs of sweet, delicious and rich chocolate made all those caramels, chews, and sweet tarts extraordinarily disappointing. Don’t get me wrong, when I was a kid, sweets were sweets, but chocolate has always been chocolate. Years have past, and though my affinity for dressing up on the best day of the years has not changed, my taste in chocolate has. No longer is it about the sugar rush or the caffeine high, it’s about the flavor, the texture, the aroma. There used to be a Gelato place in town that had the absolute best gelato I have ever had. I waited for the place to open, then went there every week to get my fix. Then it got cold and I stopped going, but as the warmer months approached, I decided it was time for my ritual to start anew. It was closed. No warning, no notifications, just a sign on the door saying goodbye. I was distraught, where in the world was I supposed to get my gelato fix? 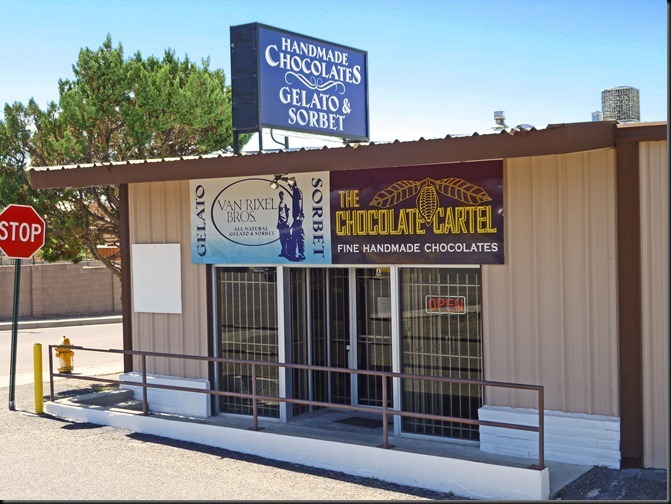 That is when I found it, Van Rixel Bros Gelato and Sorbeto. 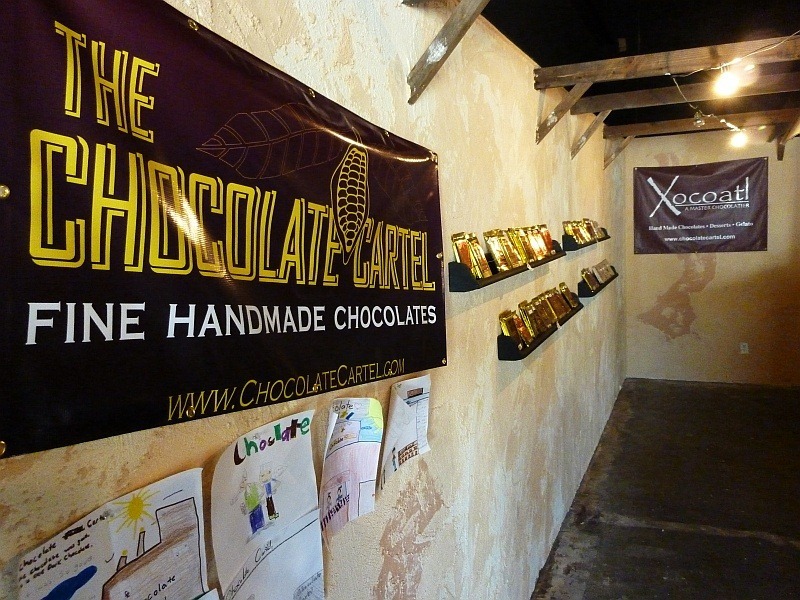 Or is it The Chocolate Cartel? I don’t really care, I have to try it. In the corner of what appears to be a warehouse is a tiny shop, easily missed by the average passerby, including myself. I have driven by this place a hundred times before and not once did I see the word chocolate OR gelato. When I entered this unusual location the inside was far different than the outside. Cases of chocolate, chocolate on the wall, shelves full of the stuff. I was in heaven. What to try first? Well that was decided very shortly by the owner, or one of Van Rixel Bros anyway. “Here, try this truffle base, this is what we use in all our truffles.” It was smooth and creamy, such a simple thing elevated to heights I had not previously known. Super rich chocolate flavor, not too sweet, not too dark, just intense and smooth. I had to try as many of them as I could. With flavors like Vanilla Lavender and Wildflower, I wasn’t sure this was going to be my kind of place after all. 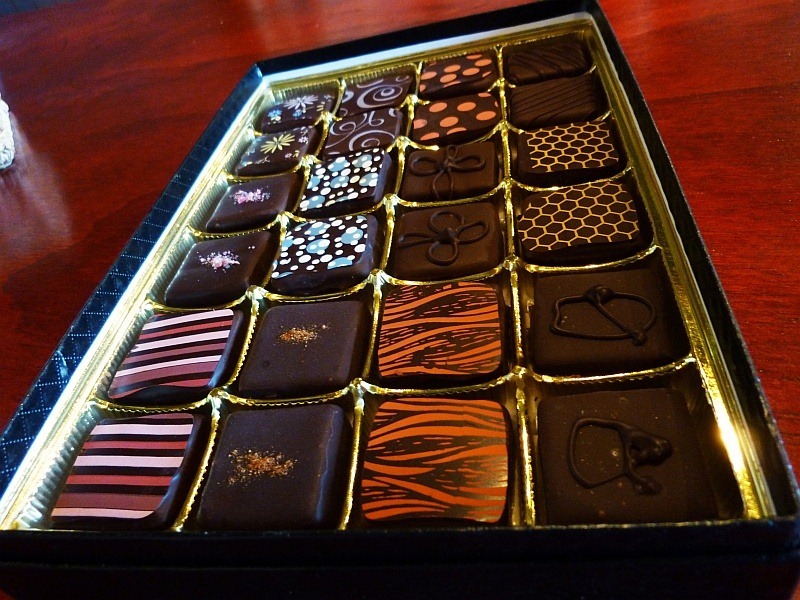 Worry not, they also have a dark chocolate, blood orange, cinnamon, smoked chile and Sea Salt Caramel. Their flavors change regularly, there is always something new to try when I go in. 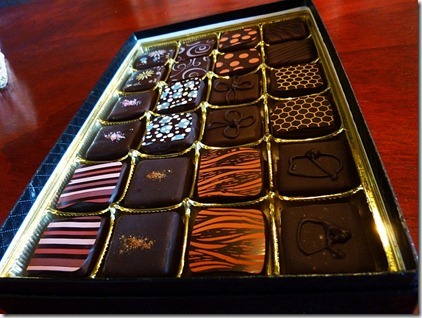 All of their truffles are beautifully designed and hand crafted. I nearly tried one of each the first time I went and let me just say, they were ALL awesome. The smoked chile seemed very mild at first, then the heat kicked in. The Blood Orange had a nice strong citrus flavor without being overpowering, peppermint, butterscotch! The chocolate has a very crisp bit to it on the outside, but the truffle inside is soft and rich and decadent. For all you nut lovers out there, you have not been forgotten. 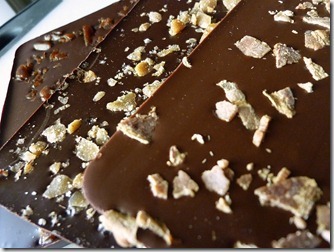 Caramel, Giandujas (nut pastes) and fruits also fill their perfectly tempered chocolate. A must when getting a box of sweets, is the sea salt caramel. The salt is like a punch in the mouth, taking all of the chocolate and caramel and turning the flavor knob to 11. There is just something about that salty/sweet mix that really puts a smile on my face. 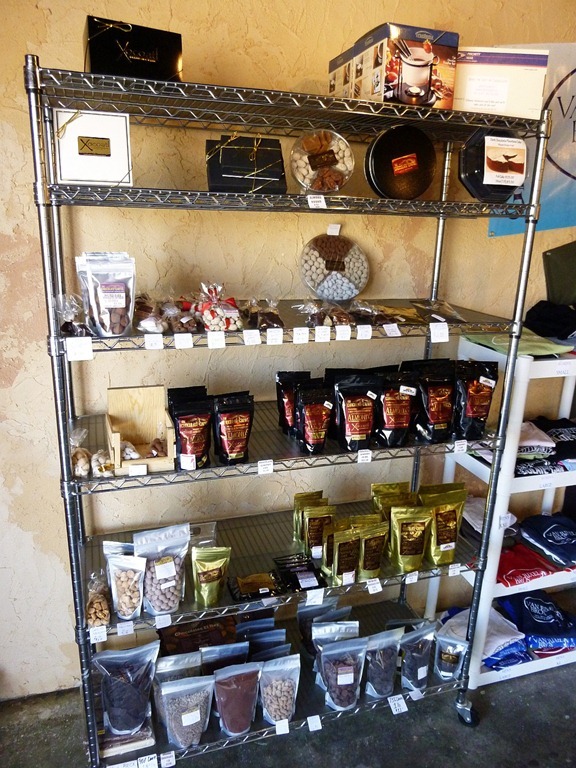 This store has more than just truffles too. 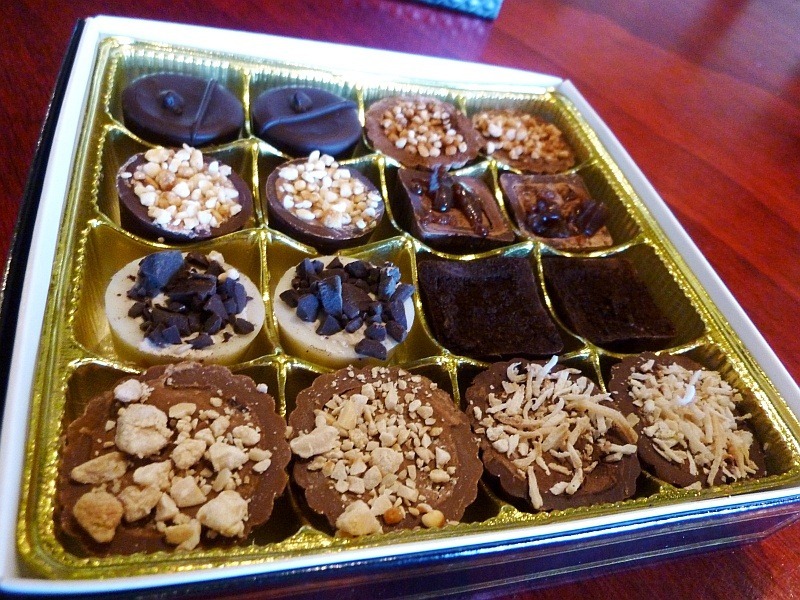 Toffee, chocolate covered almonds, cocoa powder, drink mixes, even chocolate covered parmesan cheese! A treat I attempted to get a friend of mine to taste, but he chickened out. Pfft, some parmesan lover HE is. I got the cocoa powder too and it’s intensely rich and made some of the best brownies I’ve ever had. I also used it to make a Cocoa Syrup per Alton Brown, which makes the perfect accompaniment to any bowl of ice cream, or gelato. Another bit of the chocolate that you can buy is in bar form. 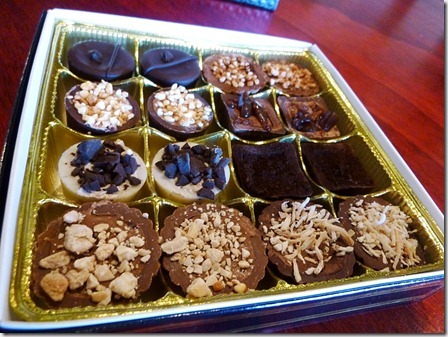 Most of which have a light dusting of toppings like cocoa nips, espresso beans, toffee, puffed rice, salt, and Bacon. This list and combinations just seem to go on and on. I will give you one warning though, if you see on a package, the label: El Diabo, that means it’s really stupid hot! Or maybe I just wasn’t expecting it to be as hot as it was, but you have been warned. Their chocolate, as with anything in the store is phenomenal. The perfect snap, the salted chocolates and the cocoa nibs are my favorites, I’m still debating on the bacon. Ok ok ok, so what about the Gelato? They don’t have a case for the Gelato, it’s all sold pre packaged. The good thing though, they have a 4 oz pack, as well as Pints and Quarts. They didn’t have the standard Gelato flavors that I was accustom to. What they DO have are ever changing. 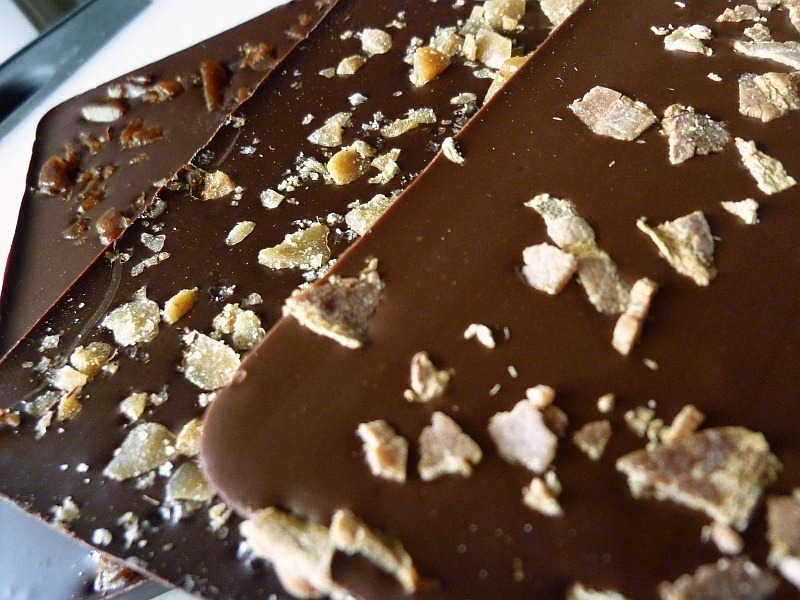 Chocolate and Sea Salt appear to stay on the menu, but the seasonal changes make for a very tough decision. I also got the smores and for my girlfriend a Lemoncello. The Lemoncello was such a tart gelato, it took me by surprise. With that said, it’s very clean and refreshing. Like drinking a lemonade, freshly squeezed, on a hot summer day. The orange was a bit sweeter, but just as refreshing. Give me a scoop of smores, chocolate and sea salt and I’m a happy camper. 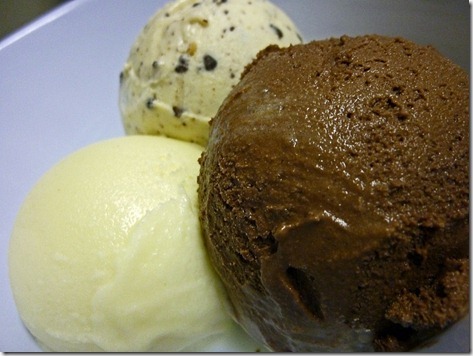 As with all gelato, the flavors are intense and a little goes a long way. If you’ve never had gelato, it’s denser than regular ice cream, containing only about 20%-35% air, compared to ice creams which can have up to 50% air. Each flavor was unique in texture as well as flavor. The sea salt almost tasted like butterscotch. The chocolate was rich and decadent. The flavors may be closer to ice cream than gelato, but this is definitely gelato at it’s finest. 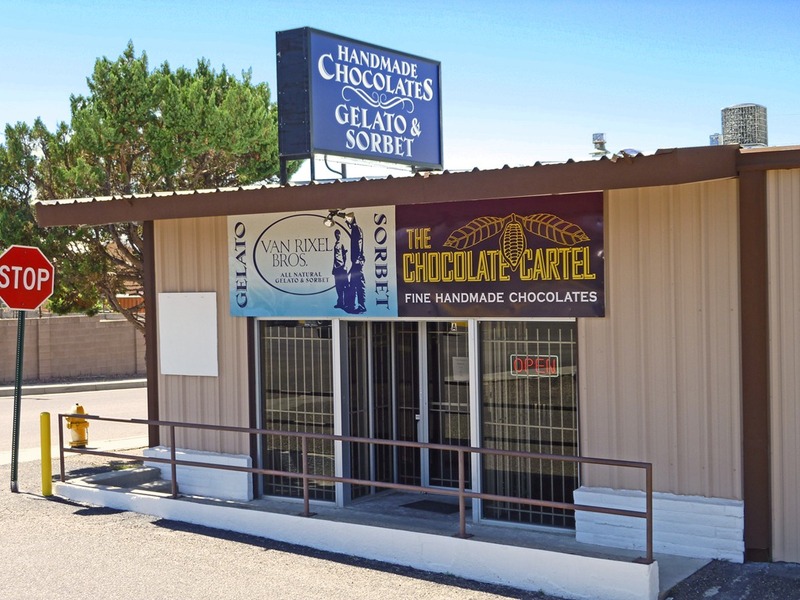 You can also find the pints at Whole Foods, but I prefer to go to the source as that is the only place you can find the chocolates, at least here in Albuquerque. There is nothing about this store that I do not like. The chocolate is amazing, the gelato, the guys running the place. With an emphasis on quality, you are assured to have a very happy Halloween, though these are treats you will want to keep for yourself.